To hear Austinites tell it, they damn near invented the taco. They’re certainly not above declaring war over one, which Mayor Adler did, even creating an Austin Taco Day (Sept 24th). 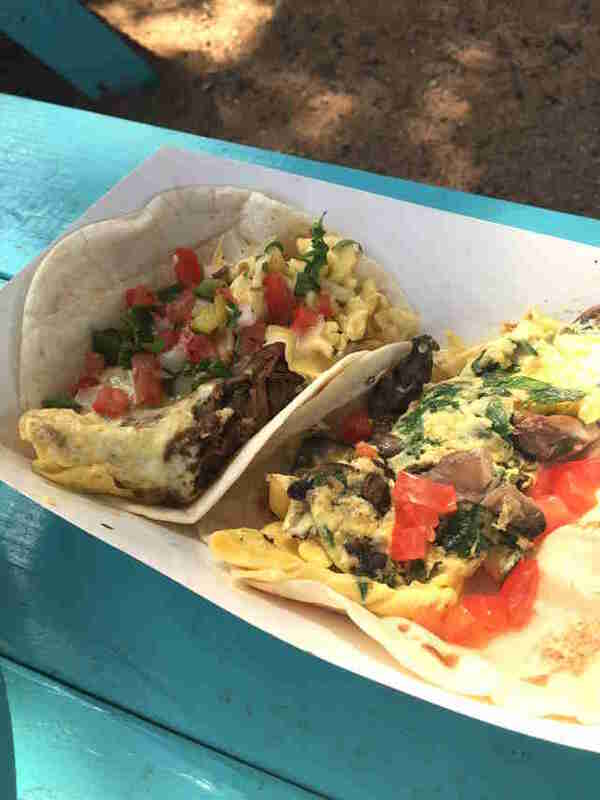 Austin is home to some of Texas’ best tacos, both breakfast and non-breakfast varieties, and the last decade has seen an increased availability of classic styles beyond the city’s typical Tex-Mex cornucopia. 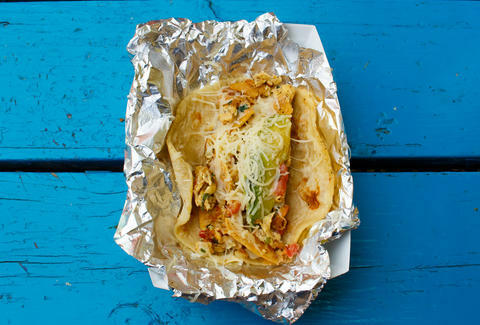 Let’s dig into a roundup of Austin’s best tortilla-based offerings of the moment. 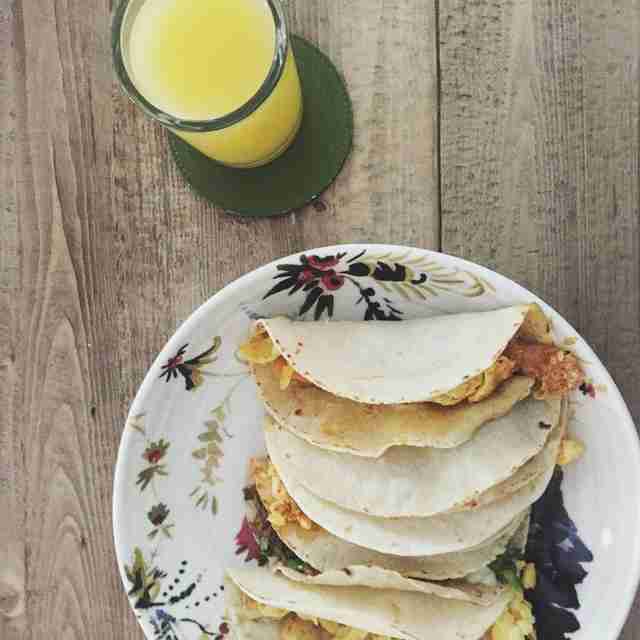 If a migas taco is done right, the eggs retain bounce while the fried tortilla strips keep a semblance of crunch. The rest of the ingredients -- the onions, tomatoes, chilies, and cheese -- fold in and accentuate the flavors. This is what mini taco truck empire Veracruz All Natural does. There is of course a fresh tortilla. In the case of Veracruz that means handmade corn discs, and we prefer to order the whole package at the trailer parked outside Radio Coffee & Beer, where you’ll need an Americano to hold you over until your order is ready. Waits can be up to 45 minutes. That’s OK, right? Austinites like to wait, in line or with restaurant pagers. Thankfully the migas taco is worth it. The line is much shorter at this family-owned and -operated trailer, where the best of all possible Texas culinary worlds hug it out all the way down your belly. Rain or shine, customers wait patiently to place their orders of smoked meats in fluffy, slightly dusty flour tortillas. The peppery brisket comes with a ribbon of smoke and gets amped up for the mighty Real Deal Holyfield breakfast taco, but you’d be doing yourself a disservice if you do not request the smoked carnitas. Surprisingly light, the cuts of pork -- sometimes chopped, sometimes shredded -- have a smoky sweetness tightened by caramelized onions and carried by the luminescent tomatillo-habanero salsa. Chile en nogada, a holiday dish of a stuffed poblano chile draped in walnut sauce and sprinkled with pomegranate seeds, isn’t a rarity in Texas. A classic stuffed chile taco (taco de chile relleno), however, is found only here and there in the Lone Star State. One of the best is served at this north Austin bakery and restaurant where a large blue corn tortilla base is topped with yellow rice and a breaded and fried quesadilla cheese-stuffed chile. The taco has a salty kick preceded by the textural wonderland that is the chewy tortilla and the generous portion of rice. 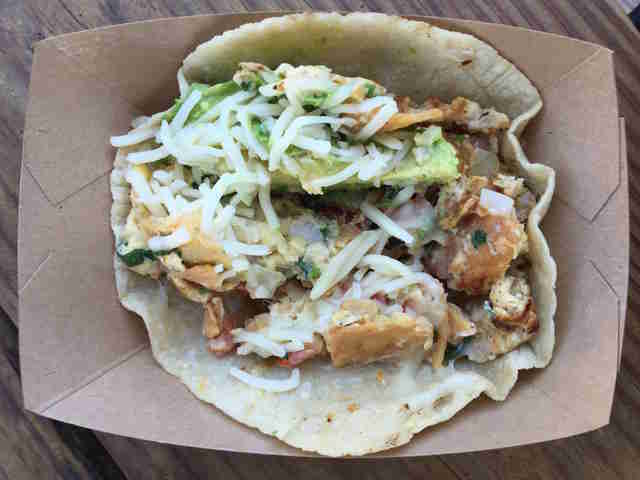 Never mind that former president Bill Clinton received a special vegan taco at this Austin wood-fired chicken concern. (He should have gone to Cool Beans for that.) It’s all about the clucking bird at Fresa’s Chicken. And it is best at Fresa’s second, bigger location with a vast patio awash in festive pastels with blocky wood tables to one side and smaller tables to the other. There’s a small pocket space for knee-biters. All of it is bordered by East Bouldin Creek to the back. It’s seriously all kinds of freaking pleasant. 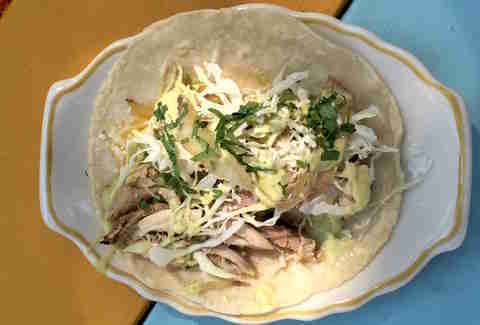 The dark meat chicken in the namesake taco is deep and juicy. 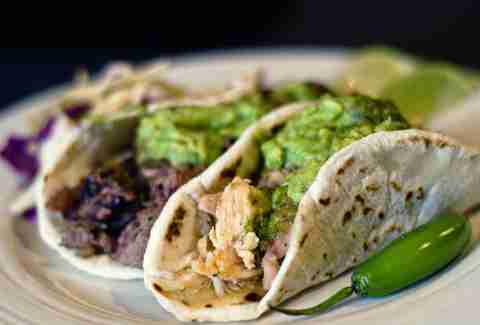 Avocado imparts a creaminess, cotija adds a milky, salty, mouth-puckering quality, and cabbage & onion give the package crunch. In other words, it’s everything a chicken taco should be. No. 4 Taco -- a parcel of black beans, eggs, and cheese bulging with protein -- will more than satisfy. The beans are al dente, the scrambled eggs have a soft-craggy give, and the salty cheese does a poor, but tasty, job of keeping it all together. If you’re over the whole bacon fad -- and we don’t blame you if you are -- the bacon used in Joe’s Bakery’s tacos won’t reconvert you, but the strips of pork, dredged in flour before frying, will likely be the only bacon you’ll want to consume thereafter. 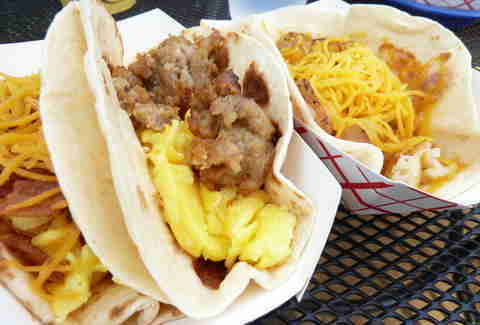 The breakfast meat’s increased density and the fact that the strips are left intact allow the bacon to hold its own against the hearty serving of scrambled eggs and cheese in the fresh, camping-bed-pad-thick flour tortilla. A bit fancy in contrast to the adjacent food truck, Takoba on East 7th St is home to straight-up beautiful pork shoulder carnitas. And no traces of refuse. Generous in portion and shredded but not stringy enough to get tangled in the spaces between your teeth, the carnitas meat is just sweet enough from the pork-fat bath simmered low and slow in the method used by Takoba owner José De Loera’s father Alberto, a carnitas vendor in his native Aguascalientes, Mexico. The carnitas’ accompanying salsa verde amps up the package into something even more delightful. A great Aztec warrior stands confidently. In his firm hands he balances a taco worthy of eating challenges on television. The art is a striking sight on the side of Mellizoz Tacos, a South Congress food truck that trades in old-school Tex-Mex (hello, ground beef), iconic Mexican (hola, carnitas) and creative (hiya, Bowman) tortilla-based noshes. But it’s the Pachuca that should be your No. 1 pick. The new breakfast menu item comes with eggs, machaca (dried salt beef typical of northern Mexico and South Texas), pico de gallo, and a melted queso so lacy and mild it can be mistaken for butter. The last outpost of a once-citywide taqueria founded by the Vasquez family, Tamale House East is owned and overseen by descendants Carmen Valera and her family. And it continues honoring Austin’s past while pushing the city’s contemporary taco culture forward with options like chicken mole, grilled fish, and cochinita pibil tacos. But it’s the litmus-test Taco No. 1, in which is tucked potato, egg, bacon, and cheese, that shines. Why is it a litmus test taco? Because the cubed potatoes are firm on the outside, fluffy on the inside, and need no extra seasoning. Tamale House East’s way with the tricky potato shows a mastery most taquerias don't achieve. This perennial Austin favorite is heralded as much for its juices and aguas frescas as it is the chivo (goat) barbacoa garnished simply with cilantro and onion, a lime wedge propped on the side of the Styrofoam plate. As is the rule with any taqueria, order the house-made tortilla; here it’s a cakey white corn disc that, try as it might, can’t restrain the abundant juices running off the goat, which, for those not into such flavors, has tinges of gaminess. 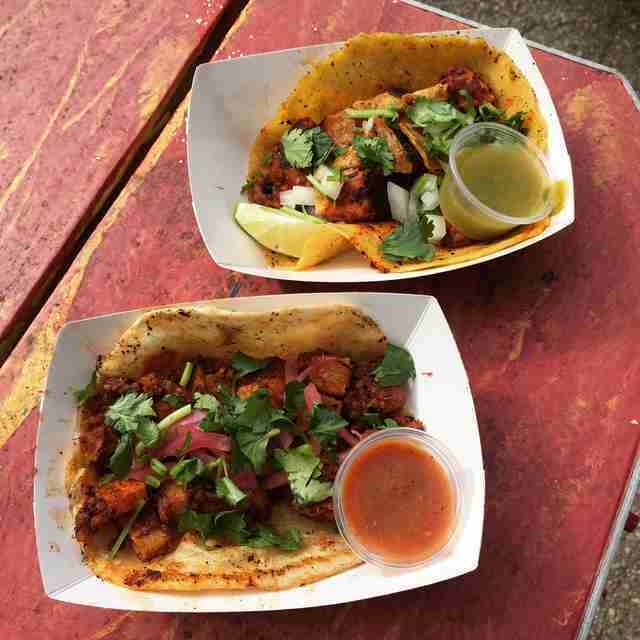 José R. Ralat is a Texas-based food writer specializing in tacos. He’s written for Texas Monthly, Munchies, Dallas Observer, D Magazine, Imbibe, this fine online media outlet, and other publications. He doesn’t believe in the existence of an inauthentic taco. Follow his trek on the Taco Trail at his website www.thetacotrail.com and on Twitter: https://twitter.com/TacoTrail.